Just when we thought Rob and Greg were comfortable settling down to retirement it’s on the road again, this time just a short trip out of town to see where Tung grew up, a town called La Phu. 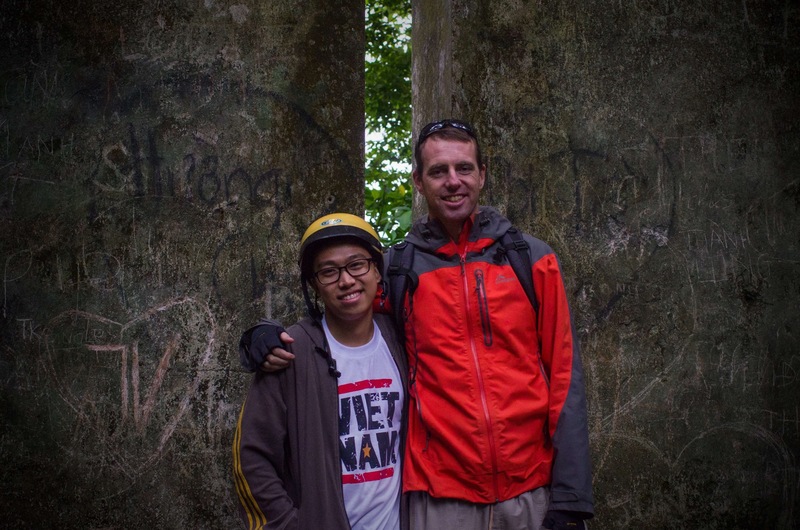 With the rainy season dousing our hopes for a venture into the northern wilderness of Vietnam this escape from the chaos of Hanoi is equal parts adventure, new experience, travel opportunity and hanging out with a new friend. The road feels so familiar so quickly, the only time in this trip we have a Vietnamese speaker with us and there’s no need to chat to a mechanic as the boys behave beautifully. I’m just a little disappointed there’s no breakdown. First stop is the Ba Vi national park, a mountainous stronghold for French forces during their occupation of Vietnam. Up into the clouds we go, literally; fog closes in around us we slow our progress to a polite crawl into the next few metres we can see, and then the next. Stone lamps line the road surrounded by trees that allow a view little more than twenty or so metres into the eerie forest and whatever lies beyond the blanket of fog too thick to pierce. Up and up we go, three peaks is the local name of this area owing to the three aggressive spires that reach for the sky, only visible on the rare occasions that clouds don’t shroud them in secrecy. An essential stop on this journey up to the peaks is apparently the church, a mere rubble shell nowadays but ripe fodder for the superstitious Vietnamese who apparently love a ghost story. 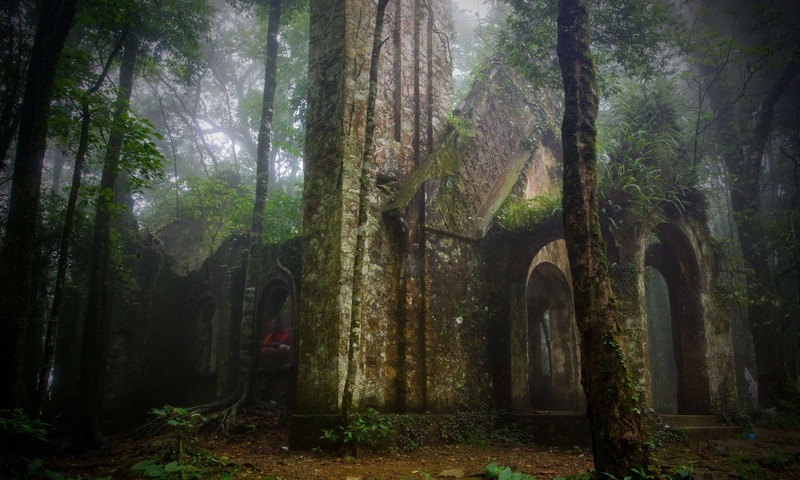 The heavy mist washing in on waves of cloud combines with a jungle overgrowing this ruin that still reaches for the sky in that very religious manner to gift us a scene tailor made for spooky stories. Of course we stage a few ghost pictures for fun before heading up to the temple peak. The stairs are punishing, the view is captivating and the atmosphere sends shivers but most of all it’s striking mainly for its discordance with the surrounding environment and climate. So close below is humid heat, tropical vegetation and flat plains but just a few minutes ride into the clouds and we’re not only into another climate or place, it’s a different imagination. Church ruin in Ba Vi national park, Vietnam. Tung is pulling out all the stops; from a chilly visit to the clouds we’re stripped nearly naked and soaking in natural thermal baths allowing the mineral rich waters to carry our worries away. After the visit to the pub on Saturday night, Tung seems a bit more comfortable with us, possibly even with himself as he opens up to a life that has remained bottled for too long. Shocking revelations are so much more jarring when delivered with indifference. Tung so casually opens up to us about his life, struggles and the challenges of being different in a society that demands community and conformity. Who ever though that community could be so destructive. The hot water laps at his skin that seems to repel it, forcing beads of water to sit prominently on his shoulders; not much gets past this skin so accustomed to keeping the world outside. With casual indifference Tung tells us of his suicide attempts with sleeping pills and being molested when he was 14. Such huge bombs to drop, trapped for so long inside this skin that allows little to pass out as well as in. “I just have to learn to deal with it” he casually declares. It appears casual, his posture is relaxed and his tone is level but it’s a charade, a well rehearsed charade from a life muffled by a world that finds it inconvenient to listen. There’s a lifetime bottled up here and we’re hearing it, how many people have heard these stories before? In his stoic way Tung seeks no refuge or escape, constantly reaffirming that he’s not a victim; but he is. He’s brave, he’s looking to a life that lies ahead, he’s carrying a world on his shoulders and living inside a skin that holds the world out and him in. This could be the definition of loneliness, loneliness in a crowded world. We want to give him a hug, we want to tell him life will be better one day, we want to say a million things but a life lived muffled into silence needs to learn how to speak, it’s a slow process. These words we’ve just heard stab our hearts but for him this is life, a life worth living; as he puts it: “If I die the people that made me do it are still here and my family will be so hurt and won’t have me”. He showers with a smile on his face apologising that the water isn’t hot enough today, so easily moving on from a topic he’s become too familiar with holding in. I can’t help but think that his casual demeanour belies a certain liberation in the news he’s just delivered, he’s trying not to be dramatic, to be a victim but I think there’s more to his words than his impenetrable skin suggests. We might be seeing the first cracks. 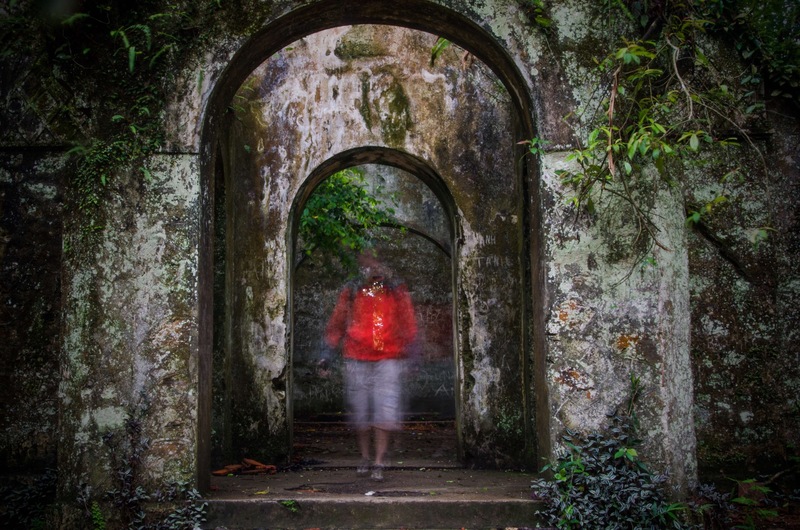 The ghost of Steve in the haunted church, Ba Vi national park, Vietnam. How do you carry news like we’ve just heard through a day and pretend that the world is ok? We live none of it personally, we have just heard the words so for a short time we adopt a tiny fraction of Tung’s life and ‘just learn to deal with it’. I feel so conflicted, so much of Viet society seems so true, genuine and endearing to us but this gross negligence of a child who is now a young man is unforgivable. In Tung’s house his parents fuss and display hospitality beyond the sour taste in our mouths; these people seem so in line with the admirable nature of the Vietnamese as we have seen, yet this home has presided over a tragedy that should never happen. Anywhere. To anyone. We wanted a view into real Vietnam, a home environment and we are getting more than we bargained for, how do we mesh together this admirable, loving home with the tragic story that Tung so stoically carries trapped inside that skin as if it’s just how life has to be? Over two BBQ ducks, a chicken, vegetables, rice and home made pork sausage we see a family as in any other place. Dad wants more conversation from his son than he gets but he’s mostly just happy he’s visiting. Mum is shy and wants to make sure we all eat enough as the house beams with a life that we guess is not usually here to this extent; their son is home and the mini festival for us is not only for us; there’s love here that can’t be denied. There’s love and there’s a changing of the guard, Tung’s father is vice president of the local community (part of the Communist party) and I get the idea that this means he’s pretty successful nowadays. Father has forged a life within a system that his son needs escape from; like Tung’s skin that system prevents them from sharing or connecting like they need to. If only the father understood how this culture turns the skin of his son to stone that even he cannot penetrate. Tung and Steve in front of the church, Ba Vi national park, Vietnam. There’s no accusation towards Tung’s parents, just loving and proud parents like anywhere else in the world. We settle to sleep in Tung’s sisters room as dad offers up more blankets to ensure our comfort; we’re struggling to put together pieces of the story we have heard with the picture’s we see. This town is idyllic, picturesque, the definition simple life purity; darker secrets are well hidden. Sadly this story is not uncommon, it’s everywhere, in every country. Even in relatively progressive Australia young people end their lives seeing no option for them in a world that finds it inconvenient to look and think. Here’s something inconvenient: in Australia, LGBTI youth are 14 times more likely to attempt suicide than their heterosexual peers. Imagine how inconvenient the rates are in more conservative countries. We hear it all the time, terms like eroding tradition, opening the flood gates to this, destroying the sanctity of that; clinging to simplicity because opening our eyes is too challenging, thinking is just too hard. Simple traditions offer solitude to those that fit in but some people don’t fit in and ask us all to challenge, to think. How horrid to think that it’s easier to let people like Tung just not wake up from the sleeping pills, easier if they just stop being so inconvenient. Accepting new things can be hard, better if people like Tung just die is the covert statement buried in denial; ignoring inconvenience is one or two steps removed from tragic outcomes but not so distant we can’t see it, shouldn’t be able to see it. It’s a big world with blood on so many hands.